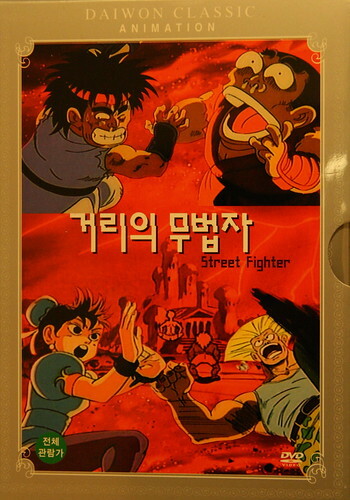 거리의 무법자 (Street Fighter) was a 1992 Korean cartoon adaptation of the game, featuring Ryu and Ken (with black hair) as a pair of snot nosed idiots who lust after Julie (based on the always popular Chun-li). They get into various japes, meet up with Blanka, Guile and Dhalsim and work together to fight off the evil M. Bison. It's a ridiculous 50 minutes of childish cartoon antics, a curiosity of sorts for those, like me, who grew up with the Street Fighter games. You can read more about it in Korean (or English with google translate) here. Such style, such panache, such special effects and makeup. It's my new favourite tv programme. 거리의 무법자 사랑해요! Interesting since in almost 8 years of searching I have never found a Street fighter Arcade machine in Korea. (And they are getting fewer and fewer). Also interesting how some of the names don't translate over into Korean, I'm thinking especially Guile and Zangief. I'm trying to recall if I ever have... I used to frequent a fair few orakshils back when I first arrived, but I too can't remember seeing any. I just have to make it my quest to find the complete Street Fighter live action series now. This interested me, i found this kind of film at YouTube with the full-lenght and now i'm wondering, if this film might be found somewhere as the DVD Rip or what do you think?